Airbags In Your Smart Phone? Jeff Bezos is known for being the CEO of Amazon, but now he’s an inventor. 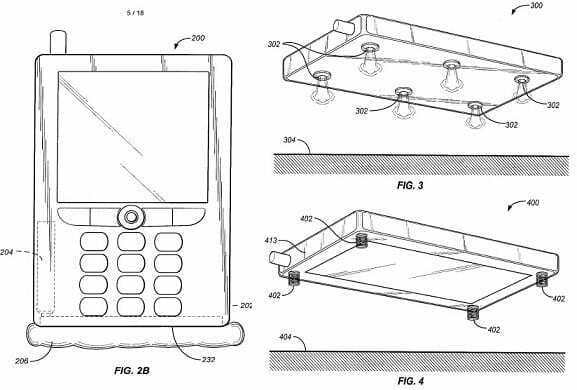 He, along with Amazon VP Greg Hart, have applied for a patent that.. puts air bags, springs, or an air cushion device on your portable electronics to protect them from falls. You read that right: air bags for your phone. The “system and method for protecting devices from impact damage” lists built-in airbags, a controlled air blast / cushion system, and small impact springs as options for cushioning the fall of mobile electronics. Alternatively, the air jets could be used to orient the device so that it always lands on its airbag.. Will your future iPad have side-impact airbags? Well.. that’s up for grabs. The patent is actually for the entire process, not just one portion of it. So it includes ideas for a sensor system that would trigger the cushioning devices, as well as the cushions themselves. Of course, the patent is written in such a way that it’s both vague and specific. (Just like all good software patents are.) But this is for a physical product. Whether this would get approved is up for question, since the patent might be considered up to snuff for software vagueries, but the physical object patent process is a little more well-defined (and strict). The patent just became public, having originally been submitted in February of 2010.
Who knows? Maybe the next Kindle will include airbags, jet propulsion for safe landings, and high-bouncing recoil springs to add that extra bit of fun to your read?